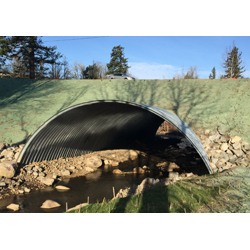 CSP culverts maintain the advantage of the strength of steel with a variety of coatings that provide long service life. With allowable fill heights of more than 100 ft and minimum covers as low as 12 ft, CSP can be matched to the strength required. Established long-term materials properties ensure product performance throughout the design life.